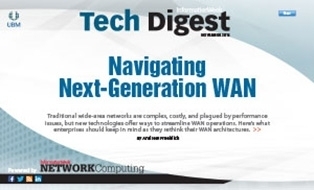 This is Network Computing's November Tech Digest on next-generation WAN architectures. Access is free with registration in the InformationWeek community. Just register at right. There's no cost, and it takes only a few minutes. Once done, click the "Access Content Now" button at right. New WAN Strategies: The wide-area network remains expensive, unreliable, and slow. Next-generation WAN options, however, promise to fix the WAN's biggest problems. SD-WAN Use Cases: Designing and implementing a software-defined WAN is complicated and expensive. That's why it's important to understand situations where it makes sense to implement an SD-WAN today versus holding off for a few more years. Managed SD-WAN: Companies that are considering a software-defined WAN must decide whether to manage the SD-WAN in-house or outsource it. There are benefits and drawbacks to both choices.